Cai and I cooked our first meal together a couple nights ago (pasta and salad). We remembered to say the shehekeyanu (the blessing for the first time anyone does anything). But after we started eating, I remembered that I'd wanted to bless the food together. Then I realized that I don't remember blessings besides the motzi (blessing over the bread) and the boray p'ree hagafen (blessing over wine). I told Mordecai I'd look them up so we could say them next time, if he was comfortable saying the blessings. He reassured me that it was fine. A few minutes into the meal, I smiled and said "Thanks for making the spaghetti. It's great!" He said "It's linguine!" I shrugged "Spaghetti? Linguine? Who cares?" Cai's brilliant response:"I'll learn the different blessings for the different foods if you learn the difference between spaghetti and linguine!" Needless to say, we have a deal. "Sweetie, I bought a KOSHER colander!" For those of you who don't know, cookware can't be kosher until it has been dipped in boiling water, stuck in the oven in high heat, or washed in the ocean. 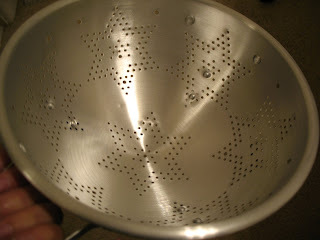 The colander has a magen david (star of david) pattern on it. Also, he said, like any good Jew, he bought it on sale. Cai is finding his Jewish roots after all.